The Hard Rock Cafe in Las Vegas hosted United Blood Services at the HRC on Paradise & Harmon as part of the "Rock the Cause" initiative. 20 people were registered, which resulted in 16 successful donations and 22 UNITS of life saving blood! Carrot Top showed up and helped out and gave each person a ticket to his show for the night to say thanks. Take Time To Be Kind. Musings On Music History: Roger Daltrey, John Bon Jovi, & Compact Discs, Oh My! 03.01: Out of the ashes of the '60s came many great rock bands. Many people identify themselves, their world views, their temperaments and predispositions by aligning themselves with either The Rolling Stones or The Beatles. "Beatles or Stones? ", we've been asked on many an occasion, sitting at a bar, contemplating life through goggles of beer. We refuse to answer that question. Instead we ask, "What about The Who?" This stumps a lot of people, them of short attention spans, them who think that '60s rock lived and died by the output of Mick and Keith and John and Paul. Hooey, we say. Roger Daltrey, Pete Townshend, Keith Moon, and John Entwistle put out music just as vibrant, remarkable, and timeless as those other guys. 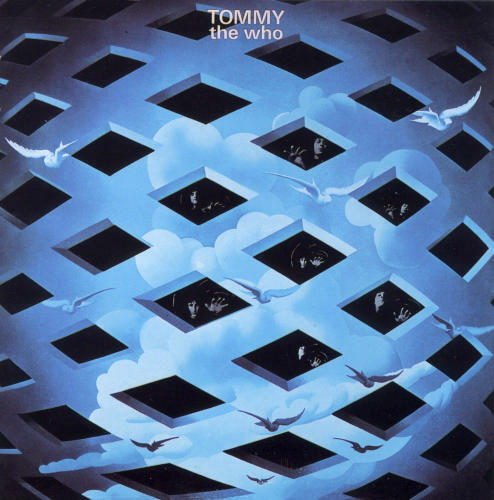 From The Who Sellout to Tommy (both brilliant albums), The Who knew how to rock a recording studio just as well as they knew how to rock a stage. These guys had it. And up front, Daltrey strutted around every stage like he owned it, like it was his to do with as he pleased, like he was about the beat the crap out of it (which he and the guys did on many occasions). Why do we bring this up? Today is Roger's birthday, as he joined us on this day in 1944. So, in honor of Roger's b-day, next time someone asks you to choose sides between The Stones or The Beatles, just say, "The Who." Amnesty International celebrates its 50th anniversary by bringing the world-renowned Secret Policeman’s Ball to the United States for the first time. Amnesty International’s Secret Policeman’s Ball comes to the United States featuring live on stage Russell Brand, Coldplay, Sarah Silverman, Jon Stewart, Reggie Watts, Kristen Wiig and many more. The event - a star-studded, legendary night of comedy and music - will take place on March 4, 2012 at Radio City Music Hall in New York City. This historic event is a spectacular evening of original comedy, multiplatinum, award-winning musical performers and collaborations, never-before-seen sketches, stand-up and guest appearances, all written around and in support of free speech. An audience of more than 6,000 people will gather at Radio City Music Hall to experience a special night filled with original performances from some of the world’s most popular entertainers including Russell Brand, Coldplay, Sarah Silverman, Jon Stewart, Reggie Watts, Kristen Wiig and many more. For tickets up to $500 (a few still available) go to http://www.ticketmaster.com/ or http://www.secretpoliceman.com/ For exclusive VIP tickets (over $500) and packages, contact spbvip@aiusa.org For more information find secretpoliceman on facebook. 02.20: Kurt Cobain. That's it. Kurt Cobain. Born on this day in 1967. The face of "grunge." The man. The myth. The legend. If you weren't there or weren't paying attention at the time or were too old or too young to care, grunge came like a tornado, destroying the '80s L.A. hair metal scene (Poison, L.A. Guns, Ratt, etc.) in a single pass, showing the L.A. poseurs for the rock wannabes they really were, their music for the insipidness it belched out on a regular basis. Cobain's band, Nirvana , tore out of Seattle, along with Pearl Jam, Soundgarden, Temple Of The Dog, Mudhoney, Screaming Trees, and Alice In Chains, in 1991, taking the music world to task, ruling rock radio for a few short years, showing the world what's up. Actually, all the Seattle bands really wanted to do was make music, to channel their creative energies into something meaningful to themselves and a few other people. That the entire country got what they were doing attests not only to their prescience, but to the universality, at the time, of what they were doing. Namely, as in Cobain's music, melding elements of luscious '60s pop with punk with alternative rock, writing lyrics based on his life, his hard and disassociated life, his disenfranchised "Generation-X" attitude, and, generally, just being genuine. This isn't to say that all Seattle music espoused this thinking or that every "grunge" band adhered to anything even remotely like this definition, but the label stuck to many bands that couldn't make it past the times and is still heavily associated with Seattle. That Cobain took his own life just two months after his 27th birthday, following years of depression and heroin addiction, doesn't take away what he did for music, giving us a bevy of incredible and heartfelt songs with his band Nirvana, such as the iconic "Smells Like Teen Spirit," the aching "All Apologies," and the incredible "Come As You Are," and spearheading the foray of intelligent, alternative, and heady rock into the mainstream. Happy birthday, Kurt. We miss ya, kid. Macau, February 14, 2012 – Dining fit for rock royalty makes its way to Macau with the opening of Hard Rock Cafe Macau! Hard Rock International announces the opening of its first cafe in the Hard Rock Hotel in the City of Dreams complex. Hard Rock Cafe Macau is located on the Cotai Strip between the islands of Taipa and Coloane, at the epicenter of the city’s entertainment and gaming district. The new Hard Rock Cafe Macau is poised to become a must-see for visitors and locals alike. The 620-square-meter cafe includes seating for 229, a vibrant bar, elevated luxury booths, a live music area, VIP lounge and Rock Shop, featuring Hard Rock’s limited-edition merchandise. Memorabilia from Hard Rock’s iconic collection adorns the walls of Hard Rock Cafe Macau, with items from many of the world’s most beloved and recognizable musicians, including contemporary artists with local ties. Key memorabilia items are now on display, from electric guitars played by Paul Stanley of KISS and Limp Bizkit’s Wes Borland, to a bass guitar used by The Who, to a pink satin shirt worn by Katy Perry. Geeks Rock (Especially At Hard Rock Cafe Santo Domingo)! Ya know, we might look like were rockin' awesome rockers, but deep down inside we're really just a bunch of geeks. Give us a moment to qualify that remark. Everyone is a geek about something, whether it's heavy metal, sports, rock, pancakes, labradoodles, or anime. You read that right. Labradoodles. That is, people have a deep, abiding love, fascination, and appreciation for those things over which they geek out. 02.13: Okay, so, many of you kids out there may only know the group Genesis from Phil Collins' frontman stint (he was already the drummer) with the band, which proved very fruitful thanks to the monster pop hits "Invisible Touch" and "Land Of Confusion." And many of you may only know Peter Gabriel from his ubiquitous '80s video for "Sledghammer" (which is still pretty awesoem, btw) or his catchy chorus to "Shock The Monkey," but his music-life goes back much further than that. So, let's hop in the Way-Back Machine and go all the way back to 1967. That's right, rock children, the genesis of Genesis begins in the late '60s, as a group of young lads decided to join forces, forming a little pop band interested in playing simple, original music. Here's where we tie our ramblings together. Peter Gabriel helmed the vocal duties for this first incarnation of the band, taking them from a late '60s pop whatever to an early '70s prog-rock, theatrical, multi-media monster, complete with masks, props, and visual framing devices to accompany Gabriel's increasingly complex lyrics and song structures. Why do we bring this up today? Well, it's Pete's birthday, as, on this day in 1961, he joined us for the first jaunt on this journey's we call "life," and we just wanted to point out that Mr. Gabriel career is much more than goofy videos and is, indeed, attached to one of the most successful bands of all time. Nice work, Peter, and happy birthday, sir. The Hard Rock Cafe in Seattle hosted the launch of the Jimi Hendrix, Signature Series 29 Merchandise program - to benefit the Jimi Hendrix Park and Fender Music Foundation. For more about the program or to purchase a T or pin click here. ALL IS ONE. Debbie Harry, who, in case you don't know because you a.) lived under a rock during the '70s and '80s or b.) weren't alive then or c.) don't know about the punk/new wave movement that lit the world on fire in the late '70s or d.) just don't care, was part of this little band called Blondie and had a couple hits and a huge influence on punk and rock and music itself, stopped by Hard Rock Cafe New York for a little get together in support of the Institute For Collaborative Education. Students and faculty from the school also took part in the evening's festivities, showing of the music skills they've learned in class, as well as their natural talent in front of the microphone. Debbie jumped in on a couple collaborations with the kids, too, making for an incredible night of money raising fun. We just wanted to share some pics and thank everyone who came out in support, as well as the student and teachers and, of course, Ms. Debbie Harry for, well, just being awesome. National Dance Institute (NDI) is a non-profit arts education organization founded in 1976 by ballet star Jacques d'Amboise. Through in-school partnerships, workshops, and public performances, NDI uses dance as a catalyst to engage children and motivate them towards excellence. Please join NDI for their 35th Anniversary Gala, to be held on May 3rd, 2012 in New York City. For more info click here. TAKE TIME TO BE KIND.